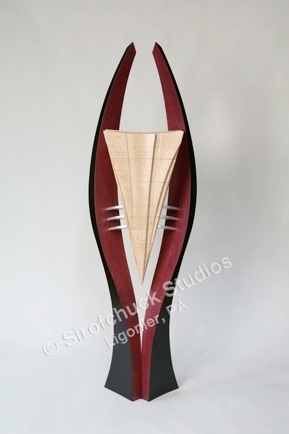 I design and craft contemporary hardwood furniture in my studio in Ligonier, PA. As a registered, practicing architect, I understand the design process and unite this with my knowledge of wood's properties to create intriguing, graceful, durable and functional "works of art" in wood. I accept commissions for work based on my own designs. On commissioned work, I collaborate with clients to create a piece that will complement the quality of the space for which it is intended and to articulate the function of the piece. Paying close attention to the beautiful grain patterns, figuring and warmth of wood, I primarily choose hardwoods grown in Pennsylvania, especially cherry, figured maple and walnut. I also incorporate accents in exotic woods, such as purple heart and ebony, as needed. Traditional joinery techniques, such as dovetailed drawers, mortise-and-tenoned joints, and tongue-and-grooved panels, not only ensure the strength and durability of the piece, but also add a decorative accent when exposed in the finished work. My furniture is finished in hand-rubbed oil, unless a lacquer is required in a certain situation.